Good news from Giulio Riggio at Fraser Yachts as he tells me that six months of negotiation have finally drawn to a close as he sells the 39m motor yacht Desamis B with Moncada Hispania acting for the buyer. Built by Benetti in 1992 to Bureau Veritas class and MCA compliant, Desamis B sleeps 10 guests in a master, two doubles and two twins and has a range of 3,200 nautical miles at 12 knots. 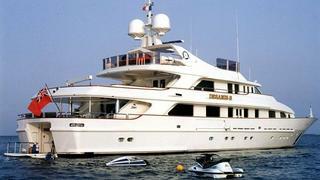 Desamis B was asking €5.5 million.